Can Pressure Washers Damage Car Paint? It’s summertime and with all the mud, pollen, mildew, grass clippings, and air pollution flying around, things are sure to get more than just a little bit dirty. Enter the pressure washer: a miracle solution for tough cleaning jobs, including your car. 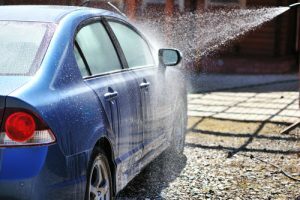 Why pressure wash your car? They most certainly can if you’re using the incorrect kind. Electric power washers with 1300 to 1900 psi are perfect for car washing as well as washing outdoor furniture, grills, plastic play sets, small decks, and patios. Gas engines offer much more power – 2000 to 3100 psi – and are more suitable for washing decks, patios, siding, fences, bigger vehicles, and boats. Professional grade power washers have gas engines that offer 3200 to 4200 psi and are best suited for paint stripping and surface preparation, graffiti removal, construction-site cleaning, and fleet maintenance. This type of washing makes your car glossy and looking like new. Pressure washing also uses less manpower, so the job isn’t as tiresome or time-consuming. You can cut your washing time by two-thirds, just from using a pressure washer! The nozzle that works best for washing cars is one that operates at 40 degrees since it gives a wide spray and washes effectively. However, if your car has a lot of mud on the under-carriage, you might want to use a 15 to 25 degree nozzle which will give you a straight gush that has enough power to get rid of caked mud and dirt. Using a detergent is very helpful in cleaning your car as quickly as possible. Most pressure washer models these days come with soap dispensers or tanks for detergent which makes washing your car pretty darn easy. Make sure you are using a soap nozzle with a bigger orifice which will allow soap to be discharged with the water. Use soaps or detergents that are meant to be used with cars because others may reduce your car’s shine and luster. Where you park your car is very important. You want it away from your house and garage; if you park too close you can damage the walls. Cover any scratches on the vehicle because the water can bubble down the scratch and onto the metal inside, causing rust. Try to avoid gravel driveways as the pressure from the machine can kick up tiny rocks which may destroy your vehicle’s paint job. Connect the pressure washer to tap water or another source of water and then turn on the machine. Rinse your vehicle with only water to remove dirt. Start working on small sections at a time, spraying 3 to 4 feet away and getting closer to apply more pressure. Begin at the top of your car and slowly make your way down to the tires. Play with the angle of the spray to achieve the best results. Make sure to keep the PSI setting below 2000 PSI, 1200 PSI being ideal. A higher pressure can damage paint, however you can use a higher pressure for wheels, truck bed, rocker panels, and other car parts for mud, grime and dirt removal. Then, apply a detergent or cleaning solution either by hand or via the pressure washer with a chemical injector. Rinse your car with only water using the 40 degree nozzle. You can even dry the car using the same spray tip! And there you have it! An incredibly clean and shiny car! Using a pressure washer can make car washing a fun chore! It’s efficient and convenient. However, make sure you don’t ruin the car by using a low PSI pressure washer, the correct nozzles, and take the proper precautions to make sure you don’t damage your car in the process.